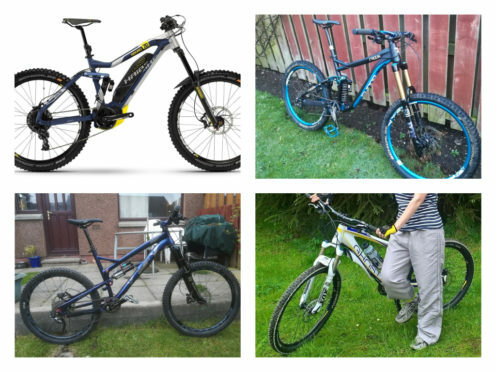 Police are appealing for information after four distinctive mountain bikes were stolen from an Aberdeen home. They were taken sometime between 2am and 6am yesterday morning in the Dunlin Road area of Cove after entry was forced to a garden shed. The bikes are not only high-value but were customised by the family who own them. “Crimes of this nature are extremely rare in this particular area and it is beyond belief that someone could be so heartless. I encourage anyone with information to get in touch as soon as possible, in particular if you saw or heard any unusual activity or people in the area during the times in question or in the lead-up. “In this case it appears entry was forced to a shed however I would like to take this opportunity to remind bike owners to take robust precautions to ensure your valuables are always safe and secure. Lock and tether your bike to a fixed items – there is a vast range of robust bike locks and security products available from specialist bike shops and other retailers. Also think about security marking your bike’s frame with a UV pen with your details. “Consider photographing your bike and recording all of your bike’s details using Police Scotland’s pedal cycle identification form which can be found on our website including the serial number and other distinguishing features which could be extremely useful in the unfortunate event that it is stolen. I would also encourage owners to register their bicycle on the National Cycle Database at www.bikeregister.com or similar sites – doing this may help to recover your bike if it goes missing. • HAIBIKE XDURO NDURO – grey men’s electric bike with blue and yellow stickers. • MISS AMR 7500 – white ladies bike with blue and white flashes on the frame. On the lower cross frame the word ‘GHOST’ is written in blue. It has a white saddle and the front and back tyres have a distinctive white rim. • RADON SWOOP 7.0 – black frame with blue stripe on the underneath of frame. Cross frame has the word ‘RADON’ written in white with a blue and white sticker. • YT WICKED LTD 160 – Custom paint-work with ‘Wicked LTD’ in white writing on frame. The pedals are chrome and blue with a black saddle that has ‘WTB’ written in white.